A review in 10 words (or thereabouts): A little bit mean girls, a little bit Big Bang Theory. Jocks vs. Nerds. Charlie's day isn't starting out great when his girlfriend, head cheerleader Holly, breaks up with him via text message. 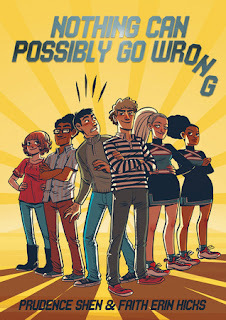 Things get steadily worse when his childhood friend, Nate, picks him up at school in a frenzy...Charlie's now ex is attempting to steal the funds the robotics team was counting on to go to the national robotics fair. Somehow, Charlie is stuck awkwardly in the middle and what happens in the following days is completely out of his control. The artwork was immediately familiar. I remember reading, and enjoying, Friends With Boys by Hicks, so it didn't take me long to become absorbed in the lives of Charlie and Nate. Nate is lovably "neurotic" as the description puts it, and poor Charlie is stuck in the middle not only at school, but at home as well. The relationship between Charlie and his parents seemed like a stuck-on side story, but his reactions seemed familiar and his frustrations real. This was just a fun read. The characters were interesting and hilarious. Holly, the mean cheerleader, looks a lot like Dalia on Suburgatory which is a little bit awesome. For a fun, quick, enjoyable read, check out Nothing Can Possibly Go Wrong.